Marsee Bakery olive bread: It’s the pits! 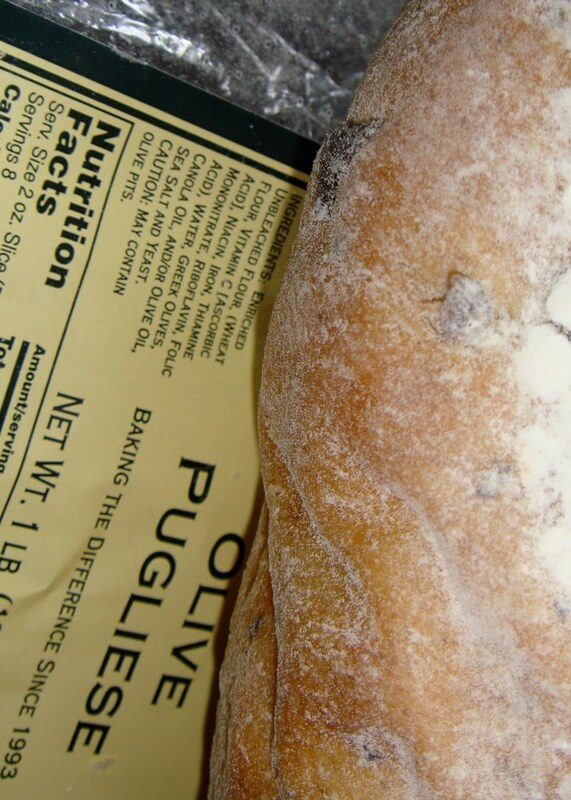 Call me mind-blowingly optimistic, but when I buy a loaf of olive bread and see a “May contain olive pits” disclaimer, I assume that any “pits” will be pretty much pulverized. Because what commercial bakery would have a quality control process that allowed pits of any DISCERNABLE size to appear in the final product? Well, for starters: Marsee Bakery. But happen it did, leaving me with two sheared/chipped teeth and discomfort I’m scared to have diagnosed by my dentist tomorrow. Luckily the loaf wasn’t shared amongst friends, since after swallowing Pit #1 and some tooth fragments I noticed—and photographed—another pit poking its not-so-little self out at the bottom. I’d certainly get a rep as hostess with the mostess if I served bread that took out someone ELSE’S teeth! WARNING. 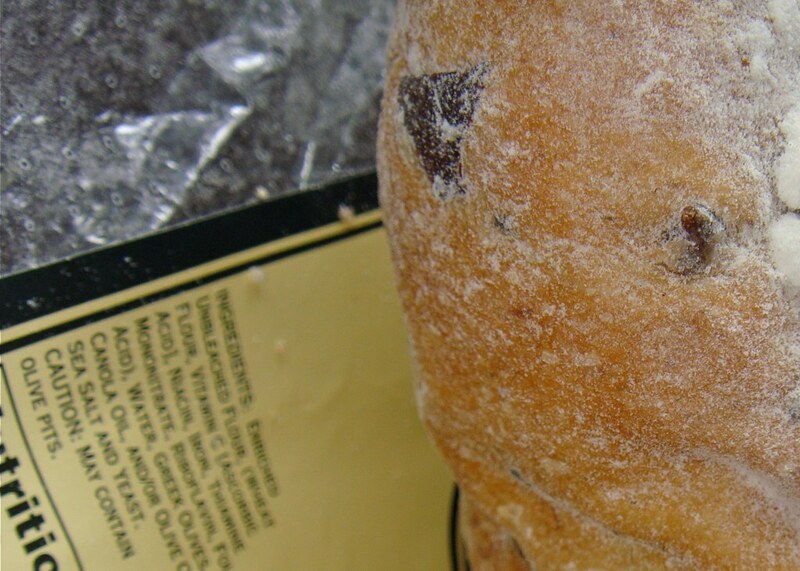 THIS LOAF MAY CONTAIN OLIVE PITS THAT CAN JACK UP YOUR TEETH AND POTENTIALLY CAUSE OTHER HEALTH PROBLEMS. INGEST AT YOUR OWN RISK! Marsee did offer to replace my two loaves of olive bread, however. [Me: “You know, I’d rather not take the risk.”] Instead, I accepted their DDS-bound refund. Though maybe I should earmark it for a JD instead. Yes, the affectionately—and non-literally—named company, located in the heart of California olive country, offers passerby an unpretentious setting and many an olive-oriented delight. Graze at their olive bar and leave wishing you’d held back on that last blue-cheese stuffed olive! Debate the ideal amount of grassiness an olive oil should have as you sample “regular” and flavored varieties! Rejoice at how their aged balsamics have a price point good for those with champagne taste and a beer budget! I’m telling you, what the Olive Pit lacks in la di dah labeling it makes up for with kickass product and super-reasonable pricing. Fortunately for those of us who only drive through Corning, California on rare occasions or don’t live near it at all, the Olive Pit does online transactions. And fortunately for those gunshy about PITS in their olive products, they seem to have mastered the art of extraction. Maybe Marsee Bakery should place a bulk order. 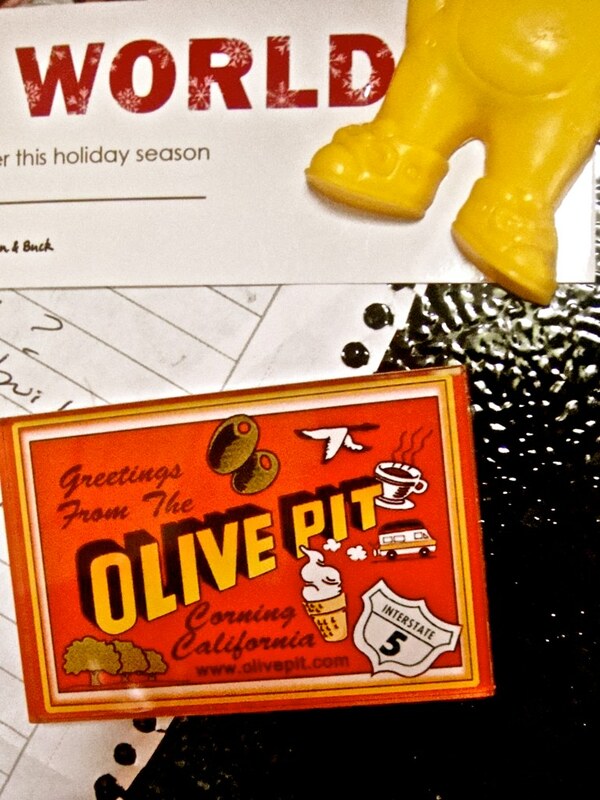 Below, one of my favorite (if unimaginative) ways to use The Olive Pit’s products…. Mix juice, honey, and vinegar together. In separate pourable bowl/measuring cup, combine oils. Whisk oils into juice mixture; add salt and pepper. ** Unfortunately not on tape. ** Not everyone will share my position, I know. So far my informal polling has resulted in a 70/30 split in favor of company responsibility. Note: All products purchased by me. No monies have been given for the writing of this post though I will be happy to accept some NEW TEETH from Marsee Bakery.